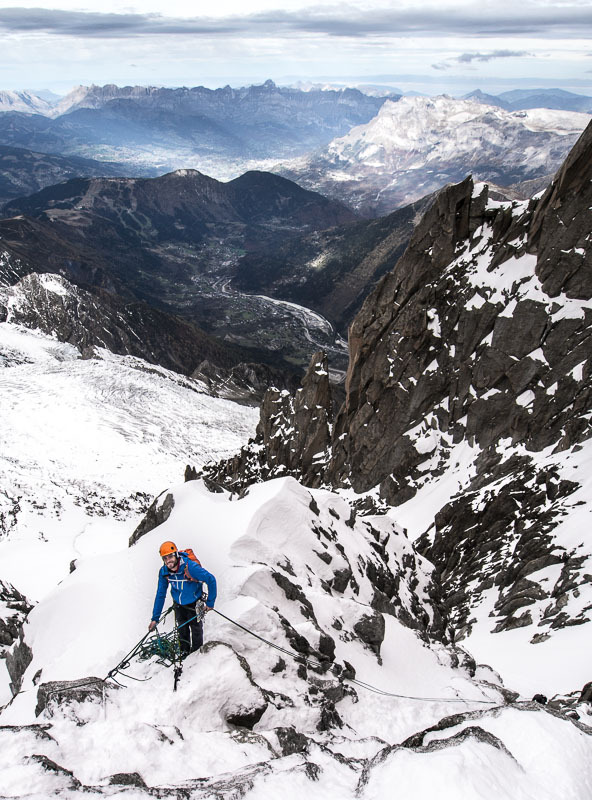 After a beautiful but rather unsuccessful day on Thursday (http://www.bentibbettsguiding.com/alpine-conditions-midi-tacul-1/) Tom Grant and I decided to head for a mixed route called Vent du Dragon off the Aiguille du Midi. 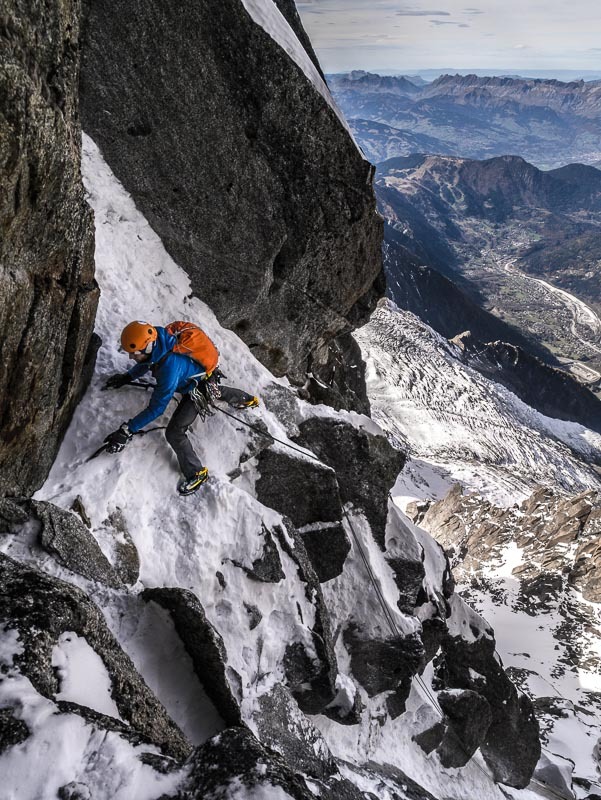 This amenable route is becoming much more popular since its inclusion in the recent and already classic ‘Mont Blanc: The Finest Routes’ by Philippe Batoux. People are already talking about this list of routes in terms of how many ‘Batoux points’ they have accrued! 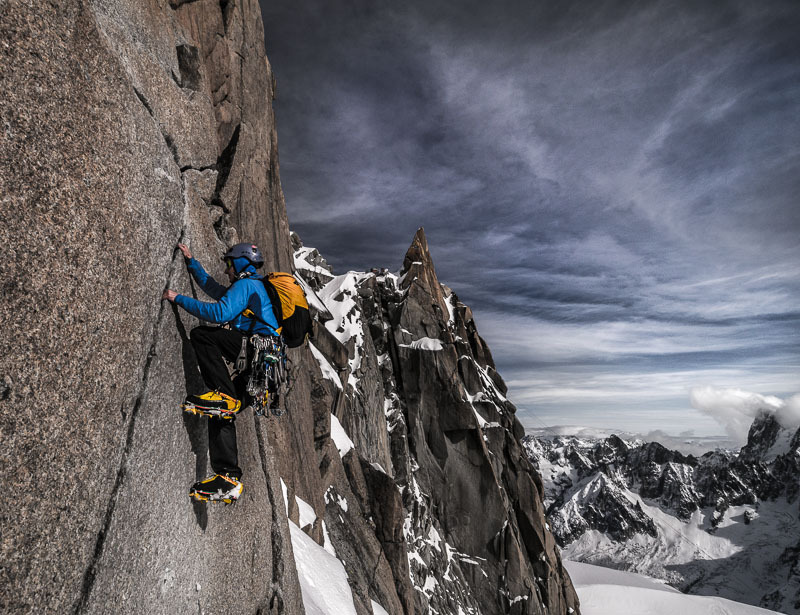 The route is actually situated on the north side of the Arête des Cosmiques, though it can be easily accessed by four or five rappels from the Aiguille du Midi bridge down into the Cunningham Couloir. For those that don’t have Batoux’s book I didn’t find much useful information available on this route so I have included a brief description of the pitches at the end with a photo topo. 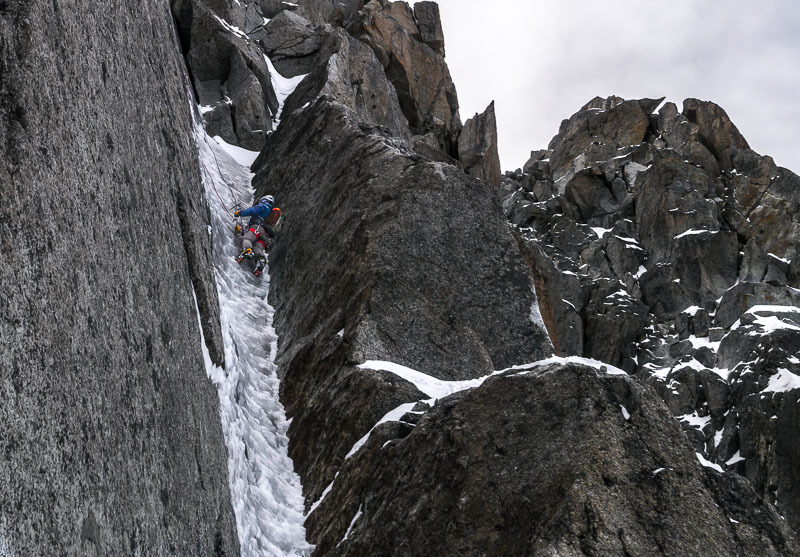 Tom Grant rappeling down into the Cunningham Couloir. In the lift up we realised that we were one of three parties heading for the same route, so we made sure we were well placed and equipped to get down the rappels first. The first rappel is usually off a sling or cord immediately on the right as you exit the North tower. The next three are on skiers right of the couloir and are bolted. After this we down climbed further to the base of the route. We had actually been given info for the route by a friend, including a picture of the first pitch. 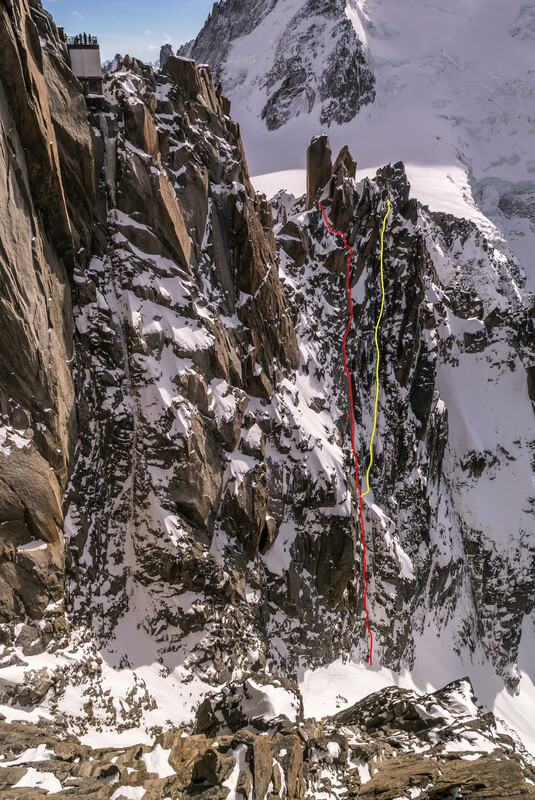 Unfortunately this photo was actually of the first pitch where the route diverges from the Profit/Perroux route after 2 pitches. 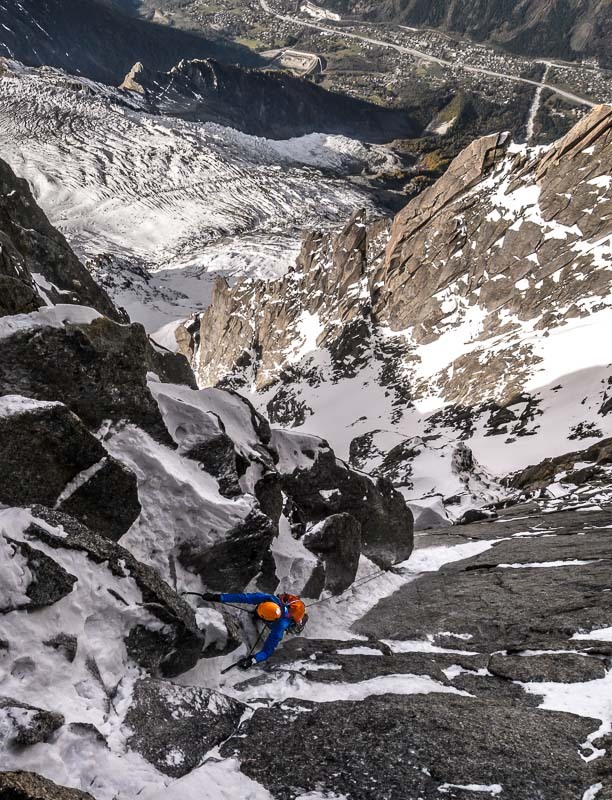 We descended the couloir looking for this image and went 100m further than the obvious line and had to reascend, by which time our Swedish friends (Hanna-Kajsa Fernström + Carl-Henrik Toll) had made their way ahead of us onto the route! Just behind us were an Italian Guide and his friend. Following us were Umberto Bado and his friend. It made for quite a social day however, and thankfully everyone was experienced enough to do their best not to knock ice onto folk below. Carl-Henrik Toll following Hanna up the third pitch. 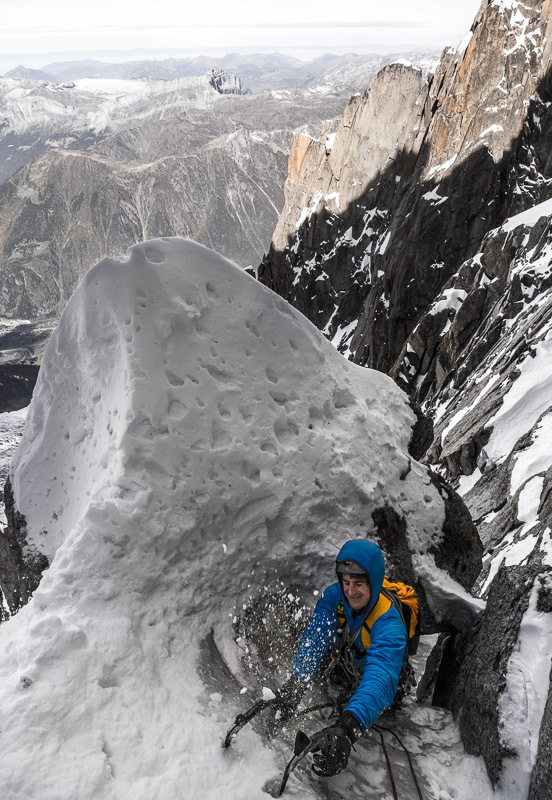 The first two pitches were fairly steady snowy mixed climbing. Pitches three and four were a little more technical. At the moment the ice in the route is quite brittle and is probably left over from last winter. It is quite sufficient though to get up the route and have fun! The third pitch starts up an ice runnel before an awkward move left under a block, then up and through a squeeze hole between the ice runnel and a large jammed block. The fourth pitch is equally interesting, with 30 metres up a discontinuous ice runnel, then an exciting step left through a cave to finish. I managed to pause in the cave for long enough to get some photos of Umberto as he lead up behind. 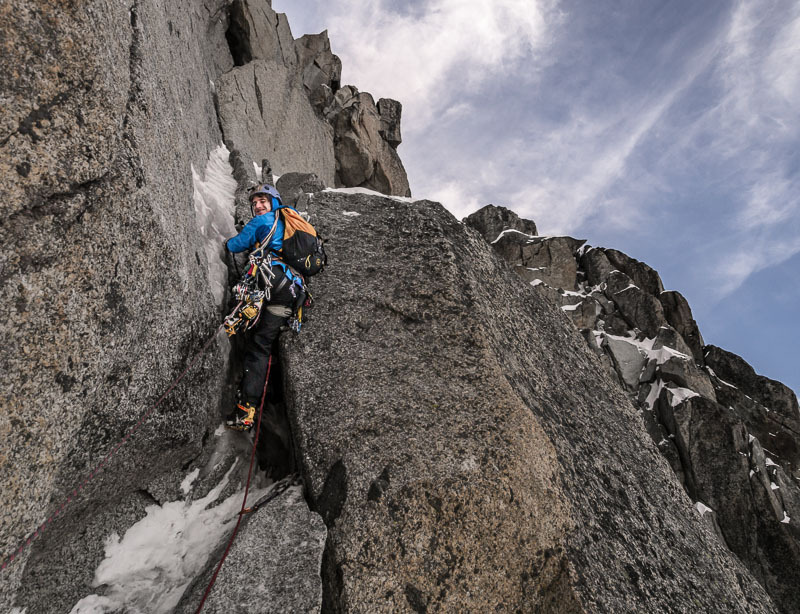 After the fourth pitch you reach a bolt belay and are just half a pitch of snow from the Cosmiques Arête. From here you are just before the short crux wall of the Arête and in 15 minutes arrive at the viewing platform. Tom heading up the wall of the Arête des Cosmiques after the route. 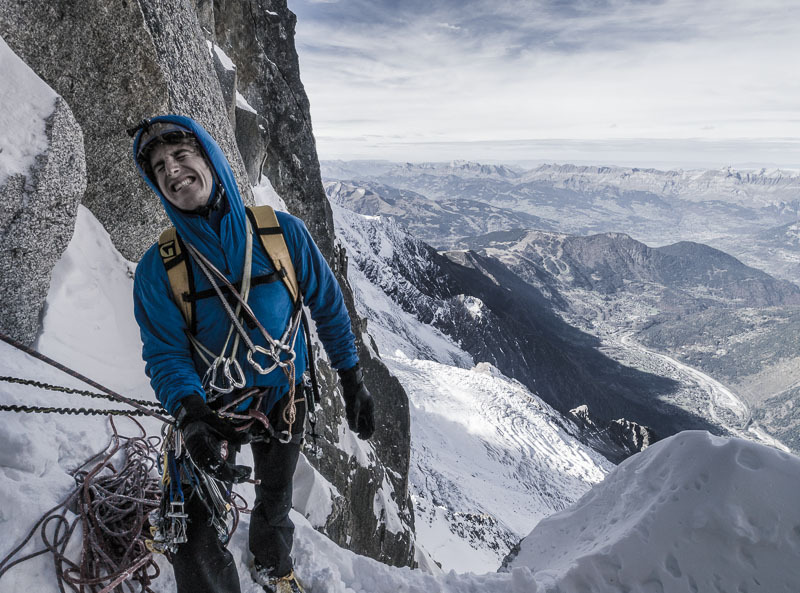 Tom on the Arête des Cosmiques. Gear: a few screws for the ice runnel. Nuts, cams + hexes. 3) c.50m. Start up the 70° ice runnel then when it ends step up left onto an awkward shelf. 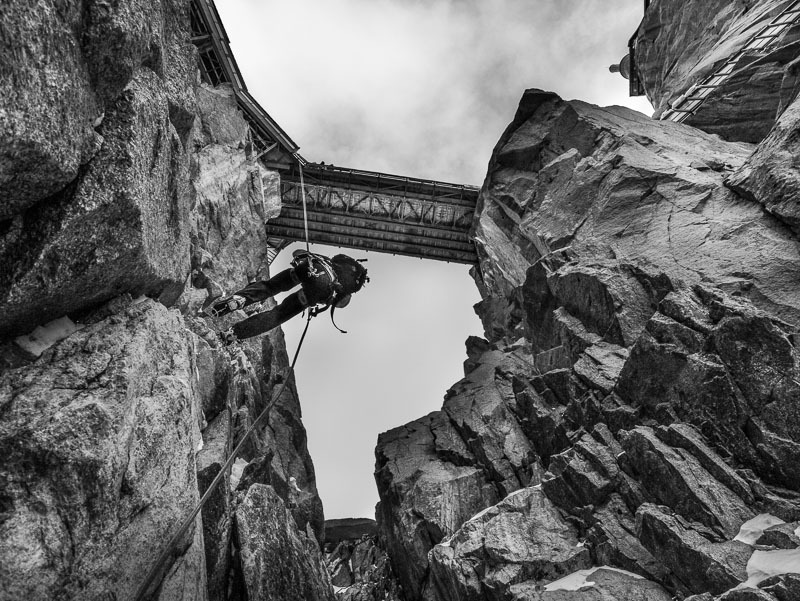 Shuffle left (crux) under the roof and then break up into another runnel. Follow this through a squeeze passage under a jammed block. Bolt Belay. 4) c.50m. Mixed chimney step leads to a runnel, follow this then mantleshelf left to another and follow this up to below a cave. Move directly left into the cave ad pull out left of this (crux) and step up to another bolt belay. 5) c.15m. 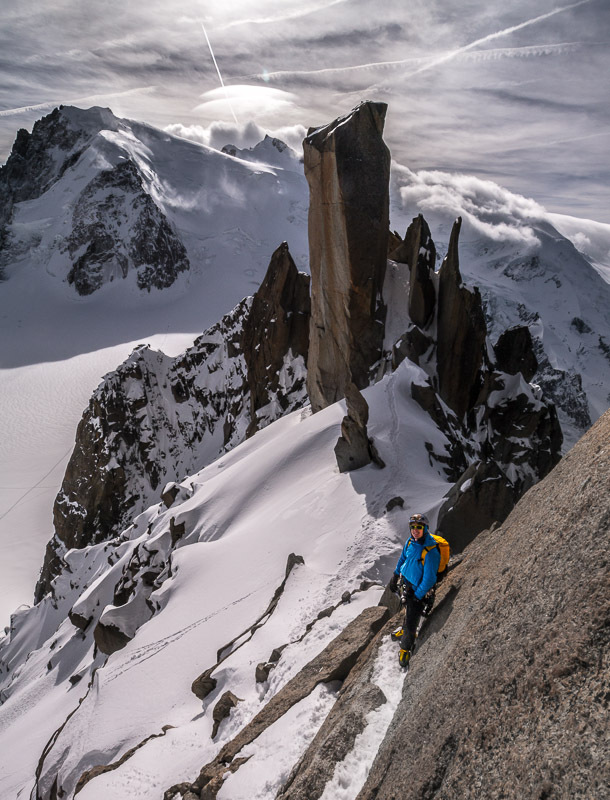 Move left around the corner then up to arrive on the Arête des Cosmiques.